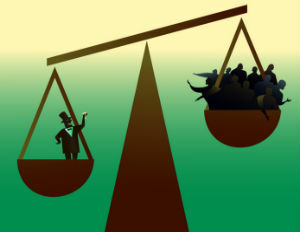 We’ve all discussed income inequality, the wage gap in the United States and how the scales seemed to be tipped in favor of the “1%,â€ but a report by the Center for Effective Government and the Institute for Policy Studies finds that when you look at the retirement assets of America’s top 100 CEOs, gaps become chasms, largely due to special perks that are off limits to those who need them most. 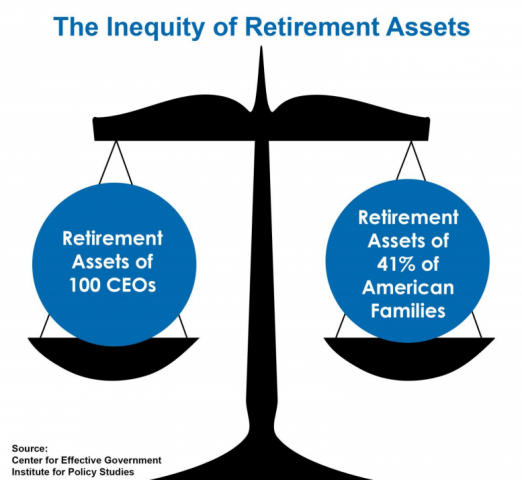 The data finds that just 100 CEOs have as much in their company retirement assets Â — a combined $4.9 billion — as the entire retirement savings of more than 40% of American families. That $4.9 billion translates into $277,686 a month, startling when you consider that about half of Americans don’t have retirement savings and those who do have enough saved to generate $310 a month, according to the Government Accountability Office. Researchers also point out that just 18% of private sector workers are covered by a defined pension which guarantees monthly payments in 2014, and that nearly half of Americans have no access to retirement plans at work. Fortune 500 CEOs have $3.2 billion in special tax-deferred compensation accounts that are exempt from the annual contribution limits imposed on ordinary 401(k)’s. The 10 largest CEO retirement funds–all held by white males–add up to $1.4 billion, compared to $280 million for the 10 largest held by female CEOs, and $196 million for the 10 largest held by CEOs who are people of color. Among ordinary Americans, 62% of working age African Americans and 69% of Latinos have no retirement savings, compared to just 37% of white workers.